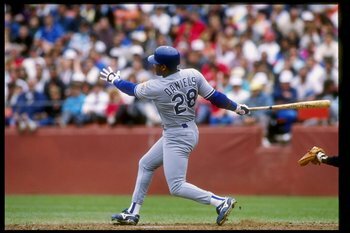 On September 21, 1990, Kal Daniels (Cedar Rapids Reds – 1983) went 4-4 at the plate with a double, a RBI and scored three runs as the Los Angeles Dodgers topped the San Francisco Giants 16-3 at Dodger Stadium. Kal Daniels hit .285 with 104 HR and 360 RBI during his 7 year MLB career playing for the Reds, Dodgers and Cubs. Kal Daniels was a member of the 1983 Cedar Rapids Reds team that finished 76-64 under manager Bruce Kimm. The Reds were eliminated in the first round of the Midwest League Playoffs by Springfield. Daniels hit .251 with 5 HR, 14 doubles and 28 RBI in 101 games for the Cedar Rapids Reds.